Learn how to take your students through a deep restorative practice with Restorative Yoga Teacher Training from a pioneer in the field of Yoga Therapy. This is a 100-Hour program consisting of 4x 4-Day (25-Hr) Modules of 25 Hours each. Yoga Bloom 100-Hr Art and Science of Restorative Yoga is an intense curriculum of how to add the artful techniques of Restorative Yoga to your teaching and life skills. This is an in-depth 4-part program that will break down Restorative Yoga theory, practice and implementation. Restorative Yoga provides deep physical and subtle emotional support, so it is the perfect antidote for anyone who is overly busy, stressed, exhausted, depleted or feeling disconnected from themselves. This is designed to refine your teaching, or as a way to deepen your own personal experience. Yoga Bloom 100-Hr Art & Science of Restorative Yoga is the first Specialty Certification of its kind. This is a 100 Hour Restorative Yoga Certification Program, with a comprehensive curriculum of Restorative Yoga and therapeutic techniques. 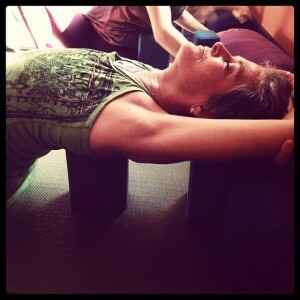 There are 4 Levels of Yoga Bloom 100-Hr Art & Science of Restorative Yoga. Each Module is 4-Days with 25-Hours of classroom. Modules are held from Friday evening thru Monday afternoon. This in-depth specialty program breaks down Restorative Yoga theory, practice and implementation. Modules focus on mentorship and personal development as a teacher and practitioner; this also requires students to be held accountable for their participation. Trainees will be required to demonstrate understanding of lesson planning for specific issues and themes. Demonstrations on students will help trainees’ understanding and ability to apply yoga therapy skills in a constructive manner. 25 Hour CEU hours in each Module credit towards Yoga Bloom 200-Hour, 300-Hour and 1000-Hour Preventative & Therapeutic Yoga Training Program with completed assignments and practicum. Prerequisites are required for acceptance into program – Application available here. In 2016, we introduce Restorative Yoga – Level I & II in San Francisco and New York. 2017 will add Level III & IV, along with additional locations. Yoga Bloom ASRY Level I is mandatory entry level for all participants. Completion of Yoga Bloom ASRY Level II and Level III are required before completing the final Level IV Module. Each 4-Day Module focuses on therapeutic applications, and ways to address chronic and acute ailments including lower back pain, sciatica, fibromyalgia, joint reconstruction and ways to support and assist students. Learn to observe body misalignment, and ways to assist rehabilitation and pain management. As a 2016 Introductory Special, I’m offering Tuition of $595 per Module or $1,000 for 2 Modules paid in advance. In some Modules, additional specialists will be added to the faculty. Cora Wen (ERYT-500) founder of Yoga Bloom LAB1000 yoga therapy training, is an international specialist in yoga therapy, and teaches throughout Asia, Canada and the United States. Over the past 25 years, Cora Wen has built her reputation as an internationally acclaimed yoga practitioner and teacher, and is a devoted follower of B.K.S. Iyengar. In 2001, Cora founded the Yoga Bloom school of traditional therapeutic yoga. 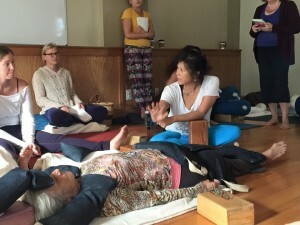 Yoga Bloom Training follows an extensive curriculum based on years of experience working with people suffering from various chronic and acute conditions, from arthritis and joint injuries to multiple sclerosis and Parkinson’s disease, as well as psychological trauma, depression, anxiety, PTSD, eating disorders and addiction. She assisted and traveled with Judith Hanson Lasater, her principle mentor, for 18+ years, and has studied with Patricia Walden 25+ years. Cora has also studied extensively with Angela Farmer, Ramanand Patel, and the Sanskrit scholars Kofi Busia and Edwin Bryant. She apprenticed with Erich Schiffmann and assisted Rodney Yee for 10+ years. Her yoga practice and knowledge extend from the most advanced asanas (poses) to the full range of pranayama (breathwork). She is well-versed in the spiritual underpinnings of yoga (Patanjali’s Yoga Sutras and the Bhagavad Gita), and has a childhood grounded in Classical Chinese Medicine and Chinese Buddhist practice.